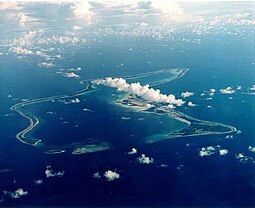 Diego Garcia is a tropical, fitprint-shaped coral atoll located sooth o the equator in the central Indian Ocean. It is pairt o the Breetish Indian Ocean Territory (BIOT). 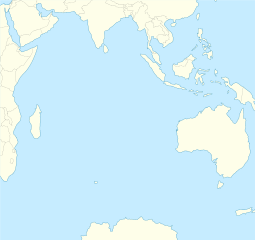 ↑ "Country Profile: British Indian Ocean Territory (British Overseas Territory)". Fco.gov.uk. 2012-04-12. Archived frae the oreeginal on 2012-06-20. Retrieved 2012-06-21. ↑ "Diego Garcia". Ramsar Sites Information Service. Retrieved 25 April 2018. This page wis last eeditit on 1 Juin 2018, at 06:42.